Physiological tissue repair is orchestrated by the interaction of macrophages, platelets, neutrophils, fibroblasts, keratinocytes, and endothelial cells, and their activation of regulatory pathways that promote healing . The major phases of wound healing - inflammation, formation of granulation tissue, and reepithelialization, together with tissue remodeling - require the finely tuned regulation of cellular dynamics and protein expression. The third, and sometimes underappreciated, pillar in wound healing is redox control. The endogenous generation of oxidants leads to reversible oxidative modifications on thiol groups, which contribute to physiological or pathological stages of wound healing . In chronic wounds, there is evidence of a misbalanced cellular redox level [3, 4]. This modulates apoptosis , decreases the expression of angiogenetic growth factors , impairs neovascularization , and prolongs inflammation , for instance, in diabetic wounds . Several downstream targets of the transcription factor p53 contribute to the regulation of cellular reactive species levels and play a major role in the cellular signaling network . Depending on species concentration, p53 activates both pro-oxidants promoting autophagy and antioxidant responses  to regulate cell repair, senescence, DNA damage recognition, proliferation, and migration . Several antioxidants and enzymes are partially sufficient to stimulate the nuclear erythroid-related factor 2 (Nrf2) pathway in skin, leading to an increase in glutathione content, thereby improving the quality of the skin  and healing responses . Hence, wound healing is subject to redox control . Cold physical plasma is a partially ionized gas and a potent source of a multitude of gaseous reactive oxygen species (ROS) and nitrogen species (RNS) . Consequently, cold plasma modulates numerous cellular processes related to redox signaling and may be useful for targeting a plethora of specific, wound healing-related pathways [17, 18]. In addition to several rodent studies [19-22], patients with chronic wounds and ulcers have also benefited from clinical plasma therapy [23, 24]. Notwithstanding the clinical success of exogenous reactive species therapy using cold plasmas, there is limited direct evidence and molecular understanding as to how reactive species may be used to trigger the appropriate redox signaling pathways to improve healing. As such, we utilized a murine full-thickness ear incision model to investigate early and late stage effects of plasma treatment in wounds. A number of targets were identified from gene and protein expression profiling that concomitantly regulated accelerated wound healing. Nrf2 and p53 signaling pathways were shown to be key factors in these responses. A total of 113 SKH1-hr hairless immunocompetent mice (Charles River Laboratories, Sulzfeld, Germany) were housed under standard conditions in an animal facility (Medical Faculty of University of Rostock, Rostock, Germany). Wounding on both ears using a microscissor was performed, as previously described by removing of upper epidermal and dermal layer . The area of the full-thickness dermal wound was ~3 mm². The present immunocompetent ear wound model is well-suited as a model system of acute physiological wound healing in humans due to the predominantly reepithelialization by migration and the absence of muscle contraction [12, 25-27]. All experiments were approved by the local ethics committee according to the guidelines for care and use of laboratory animals (7221.3-1-013/14 and 044/16) and to the NIH Guide for the Care and Use of Laboratory Animals. An atmospheric pressure argon plasma jet (kINPen; neoplas tools, Greifswald, Germany) was used, which ionized a flow (5 standard liters per minute) of argon gas (purity 99.9999; Air Liquide, Krefeld, Germany) at 1 MHz. Plasma treatment of wounds was performed using the tip of the plasma effluent at a constant distance of 8 mm using a autoclavable spacer. Ear wounds were treated for 3 s or 20 s or with hydrogen peroxide (H2O2, 1 mM; Sigma-Aldrich, Traunstein, Germany). Treatment was administered three times per week with plasma or a placebo (argon gas alone) or were left untreated (ctrl) over 6 (thrice in total; only females) or 14 (six times in total) consecutive days (Figure S1). An overview of experimental design including the number of animals in all experimental groups is given (Table 1). The study protocol and number of animals were in part specificied by the local ethics committee. Reepithelialization and wound closure were studied by stereomicroscopy (Leica Microsystems, Wetzlar, Germany) on the day of wounding (d0) and every third day after thereafter. Homogenization. For expression analysis, tissue from right ears was collected at day 6 and 15. Briefly, fresh tissues from ears were removed, snap-frozen in liquid nitrogen, and stored at -80°C. Homogenization was performed in RNA lysis buffer (Bio&Sell, Feucht, Germany) for gene expression analysis, or in RIPA buffer containing protease and phosphatase inhibitors (cOmplete Mini, phosSTOP, PMSF, Sigma-Aldrich, Traunstein, Germany) for protein validation experiments using a FastPrep-24 5G homogenizator (MP biomedicals, Heidelberg, Germany). mRNA analysis. Total RNA was purified according to the manufacturer's instructions (Bio&Sell, Feucht, Germany) and RNA quality was evaluated using Bioanalyzer 2010 (Agilent, Santa Clara, CA, USA). For quantification of mRNAs by quantitative PCR (qPCR), 1 μg of RNA was transcribed into cDNA and qPCR was conducted in duplicate using SYBR Green I Master (Roche Diagnostics, Basel, Switzerland). Gene specific primers were used from BioTez (Berlin, Germany) as shown (Table S1). The housekeeping gene GAPDH, whose expression was unaffected by plasma, was used as an internal control for normalization. Gene expression was analyzed using the ΔΔCT method. Protein analysis. Protein targets were validated on the basis of their significance within the main cellular responses. These included molecules of the Nrf2-pathway (e.g. HO-1 and Nqo1) as well as antioxidative response targets such as Sod1, Cat, Trxr1, Prdx6, KGF, Akt, and phospho-Akt (p-Akt). GAPDH served as housekeeping protein (all Cell signaling, Frankfurt/Main, Germany). Western blot analysis was performed using WES according to the manufacturer's instructions. Band intensities were quantified using ImageQuantTL Software (GE Healthcare, München, Germany), and expressed as fold change compared to the corresponding control. Blood serum was collected retrobulbary in EDTA-tubes at days 0 and 15, centrifuged, and stored until use at -80 °C. Cytokine levels in serum were measured using bead-based multiplex cytokine analysis (BioLegend, San Diego, USA) according to the vendor's protocol, acquired on a CytoFlex S flow cytometer (Beckman-Coulter, Indianapolis, IN, USA) and analyzed using LegendPlex software 8.0 (VigineTech, San Diego, CA, USA). To evaluate the effect of cold plasma on cellular translocation of Nrf2, dermal fibroblasts and epidermal keratinocytes (Figure S2A) were isolated from SKH1 skin (n = 6) and cultivated over 14 days in a keratinocytes or fibroblasts EMEM medium (PromoCell, Heidelberg, Germany) at 37°C with 5% CO2 in a humidified incubator. In knockdown experiments, siRNAs (1 µg) targeting Nrf2 and Keap1 were transfected into keratinocytes using Effectene (Qiagen, Hilden, Germany) transfection reagent according to the respective protocol . Knockdown of both genes was validated by semi-quantitative PCR (Figure S2B) and by qPCR. Seventy-two hours after transfection, cells were plasma-treated for 60 s and incubated for 20 min prior to down-stream investigations. A non-targeting siRNA (scRNA) was used as a negative control, and a GFP plasmid was employed to determine transfection efficacy (Figure S2C). On days 6 and 15, wound regions of the left ears and organs such as lungs, brains, spleens, and livers were collected and fixed in 4 % paraformaldehyde (Sigma-Aldrich, Traunstein, Germany) overnight. Paraffin blocks were cut into 5 µm-sections using a microtome to retrieve tissue sections that were stained with hematoxylin and eosin (H&E; Carl-Roth, Karlsruhe, Germany). Collagen fibers were visualized using picrosirius red (Direktrot 80, Sigma-Aldrich, Traunstein, Germany) as described . Identification of myeloid cells. Macrophages (including Kupffer cells) were labeled with an anti-F4/80 antibody (#14-4801; Affymetrix, Frankfurt/Main, Germany). In wounds and spleens, neutrophils were identified with an anti-Ly6G antibody (#14‑5931; Affymetrix, Frankfurt/Main, Germany). After washing, sections were incubated with an immuno-peroxidase polymer (N-Histofine staining reagent; Medac, Germany) or with a secondary antibody coupled to an Alexa-Fluor 594 dye (Life Technologies, Darmstadt, Germany). Detection of proliferation and apoptosis. Ki67 labeling of proliferating cells (IHC-00375, Biomol, Hamburg, Germany) was performed in paraffin-embedded ear tissue sections according to the vendor's instructions. Terminal deoxynucleotidyl transferase (TdT) dUTP Nick-End Labeling (TUNEL) assay (Roche, Basel, Switzerland) was used to detect late apoptotic cells known to have fragmented DNA. In both stainings, Hoechst 33243 (Sigma-Aldrich, Traunstein, Germany) was used to counterstain nuclei. Microscopy and data evaluation. Stained sections were mounted onto glass microscope slides using a mounting medium (VectaShield; Biozol, Eching, Germany) prior to analysis using an Axio Observer Z.1 (Zeiss, Jena, Germany). At least three to five fields of view (FOV) were analyzed per animal and ear wound. As a reference point, a standard 20 × microscope objective has a resolution of ~0.8 μm and an FOV of ~5 × 10-2 mm2 and was used for our analyses . Proliferative (Ki67 positive, red), and apoptotic (TUNEL positive, green) cells were counted, and the ratio between green or red nuclei over the total number of nuclei (Hoechst, blue) was calculated in three directly neighboring FOV within the wound granulation tissue. Macrophages (F4/80 positive) and neutrophils (Ly6G positive) were quantified as density and are given as n/n of Hoechst in a FOV (number of red cells / number of Hoechst cells in the same area). All quantification were analyzed using Fiji macro collection for ImageJ software. By using qualitative scores between 1 to 5 (1 = none, 2 = minimal, 3 = moderate, 4 = pronounced, 5 = high/complete) collagen patterns, inflammation, granulation, angiogenesis, and apoptosis were analyzed in paraffin-embedded sections within three to five FOV (Table 2). After retrobulbar injection of 0.1 mL phosphate-buffer saline containing 2% fluorescin isothiocyanate (FITC)-labeled dextran (150 kDa; Sigma Chemicals, Deisenhofen, Germany) for the visualization of blood vessels, the angiogenetic effects of plasma treatment (only for 20 s) were analyzed in wound ear regions on days 6 and 15. An intravital fluorescence epi-illumination microscope (IVM, Axiotech Vario; Zeiss, Jena, Germany) was used and a qualitative scoring of newly formed blood vessels was completed. For quantitative measurements of angiogenesis and neovascularization, FITC-dextran stained microvessels were analyzed with IVM (Figure 6AIII). Functional microvessel density (FMD), defined as the total length of microvessels per FOV (cm/cm²), as well as radial and circular capillary diameter were assessed in up to three images using ImageJ software [26, 31]. All experiments were done with tissue of 3-9 animals per group. In vitro assays were repeated three times independently. Values give mean + S.D. If not indicated otherwise, and data were statistically compared with p values indicated by *p<0.05, **p<0.01, or ***p<0.001. Graphics and statistical analysis were performed with prism 7.04 (GraphPad software, San Diego, CA, USA) using unpaired Student's t test or one-way ANOVA (for angiogenesis). We examined the cold plasma's potential to promote reepithelialization in our mouse model of dermal full-thickness ear wounds (Figure S1A-B). Mice either received treatments three-times per week or were left untreated (ctrl) over 6 and 14 consecutive days after wounding (Table 1). Wound closure kinetics suggested improved healing in the plasma‑treated wounds compared to the non-treated wounds (Figure 1A-B). Quantitative analysis showed significantly accelerated wound closure beginning on day 3 in females (right) and on day 6 in males (left, Figure 1C). A near-complete reepithelialization (92-98 %) was achieved on day 12 without scar formation (Figure S1C). On day 15 post wounding, the thickness of the newly formed epidermal layer was comparable in all experimental groups (Figure 1D), suggesting normal, physiological healing among all groups. Placebo treatment with argon gas (data not shown) and hydrogene peroxide controls were similar in range as untreated controls (Table S2). Overview of experimental groups, treatment regimes, time of sacrifice after wounding, and gender (d, day; s, seconds). Primary cells (e.g., keratinocytes and fibroblasts) were isolated from the skin of ten males and cultivated over four weeks as described in material and methods. Healing responses were examined by scoring of five parameters (Table 2) that include tissue collagen patterns (distribution, fiber orientation, early and mature collagen, amount of collagen), inflammation (inflammatory infiltrate), granulation (granulation tissue, cell accumulation, cell migration), angiogenesis (blood vessel formation, vascularization), and apoptosis (blebbing, shrinking, condensation). Each of the five parameters was graded from 1 (worst regarding healing) to 5 (best regarding healing) on days 6 and 15, and included the following features for each score: lack of healing response, absence of collagen fibers, high inflammatory infiltrate, absence of granulation tissue, no blood vessel formation and apparent apoptosis (score 1); thin epithelialization, scanty collagen fiber formation and granulation, marked inflammation with presence of immune cells, mild microvessel formation, and pronounced apoptosis (score 2); moderate collagen deposition, granulation, inflammation, microvessel formation, and apoptosis (score 3); pronounced collagen deposition, mild inflammation, profound granulation and blood vessel formation, and mild apoptosis (score 4); and complete wound closure with plenty of collagen fibers, absence of or minimal inflammation, profound tissue granulation, apparent angiogenesis, and lack of apoptosis (score 5). Overshooting collagen is the main reason for fibrosis . At the early time point (d6), picrosirius red (PSR)-stained fibers were increased in all plasma-treated groups (Figure 1D, right diagram). Although the accumulation of collagen fibers appeared regularly ordered with multiple orientations within the dermal layers (Figure S1D), evaluation on day 15 revealed a significant increase (score 3.9) especially for 20 s of plasma treatment (Figure 1D, left and middle diagram). For tissue granulation and inflammatory infiltrate, no significant differences were observed on day 15 in contrast to day 6. The mean inflammation score was 4.8 (3 s) and 4.4 (20 s) in plasma-treated groups. Based on evaluation of cell accumulation and cell migration the mean granulation score was 2.5 for both plasma-treated groups. Apoptosis was less pronounced upon plasma treatment (score 2.9 for 3 s and 2.7 for 20 s) compared to the control group (score 1) on day 6. Importantly, formation of new blood microvessels (microvessel outgrowth) was marginally but significantly increased in plasma-treated animals with a score of 3.4 (3 s) and 3.1 (20 s) in contrast to controls (2.1). The majority of features for plasma-treated animals scored significantly better compared to controls as shown in Table 2 (asterisks). Plasma treatment significantly accelerated wound healing in both male and female mice. (A-B) Representative images of wound healing progress in the treatment (treatment time as indicated) and control groups on days 0 (I), 6 (I`) and 9 (I``). White circles represent wound margins in males (A) and females (B). (C) Wound closure was monitored by transmitted light stereomicroscopy and quantified by ImageJ software on every third day over 15 days and related to wound size on the day of surgery (d0). The wound closure rate is plotted as the percentage reduction of the original wound area over time for males (left) and females (right) when compared to the untreated controls. (D-E) Hematoxylin and eosin (H&E), picrosirius red (PSR), keratin 1 (KRT1, red), and keratin 14 (KRT14, green) staining of ear wounds on day 15. Quantification of collagen fibers using fluorescence microscopy (diagrams in D) and qPCR of KRT1, KRT14, and inducible nitric oxide synthase (iNOS) on all time points (diagrams in E). Males and females were used on d15 (as indicated, n > 8); on d3/d6 only females were available for the measurements (n > 3). Data are presented as mean +/- S.D. ; *p<0.05, **p<0.01, as compared to controls (ctrl / 0 s) at each day and assay; scale bars are 1 mm (A) and 50 µm (D-E). 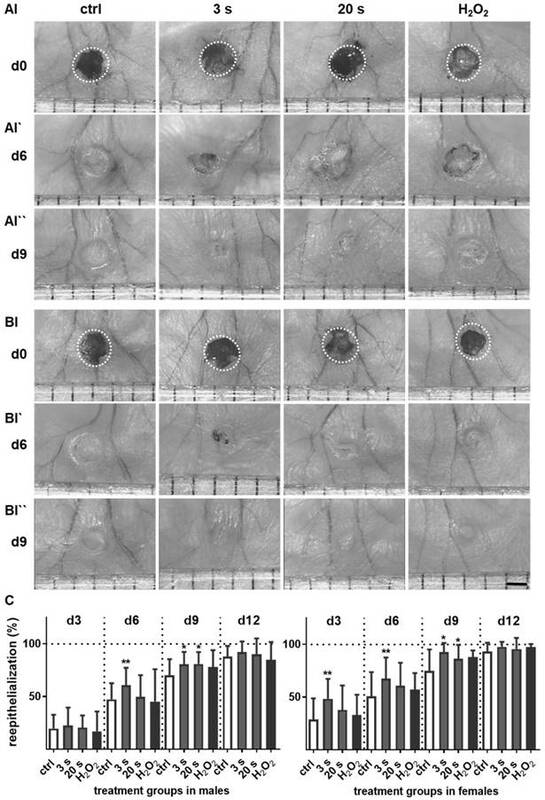 Plasma-induced effects on wound healing evaluated on days 6 and 15 using parameters to qualitatively assess healing scores with regard to collagen pattern (distribution, fiber orientation, early and mature collagen, amount of collagen), inflammation (inflammatory infiltrate), granulation (granulation tissue, cell accumulation, cell migration), angiogenesis (blood vessel formation, vascularization), and apoptosis (blebbing, shrinking, condensation); n.d. = not determined, *p<0.05; **p<0.01; ***p<0.001) modified from [12, 54, 81]. Each feature was graded from 1 (worst) to 5 (best) regarding healing. Collagen pattern d6 2.0 ± 0.1 2.5 ± 0.1** 2.5 ± 0.1* n.d.
Inflammation d6 1.0 ± 0.2 4.8 ± 1.3* 4.4 ± 2* n.d.
Granulation d6 1.0 ± 0.06 2.5 ± 0.01** 2.5 ± 0.02* n.d.
Angiogenesis d6 n.d. n.d. n.d. n.d.
Apoptosis d6 1.0 ± 0.18 2.9 ± 0.20*** 2.7 ± 0.16*** n.d.
No alterations in the early keratinocyte differentiation marker keratin 1 (KRT1) were observed, either with immune fluorescence microscopy or qPCR on day 15. Using the same methods, we identified significantly pronounced keratin 14 (KRT14) on day 15 in the plasma groups. Additionally, an early and sustained accumulation of inducible nitric oxide synthase (iNOS) was found providing evidence of the anti-microbial properties of cold plasmas (Figure 1E). Myeloid cell influx and differentiation dictates the inflammatory response in injury. Significantly more macrophages and neutrophils were found in plasma-treated wounds on day 6 and their presence was confirmed with immune fluorescence (Figure 2A-B). On day 3 in females, only a tendency of increase of F4/80 and Ly6G-density was demonstrated. This effect was finished on day 15. Scattered inflammatory cell aggregation or multinucleated swollen macrophages were not detected in H&E or immune fluorescence staining (Figure 1D). To map the temporal inflammatory expression pattern, we performed expression and secretion analyses of several cytokines at different intervals during wound healing. The induction of interleukin 1β (IL-1β), IL-6, and tumor-necrosis factor α (TNFα) were particularly rapid and strong. In contrast to this proinflammatory profile, MCP-1 and IL-4 were in tendency reduced on days 3 and 6 in the plasma groups. Plasma-treated wounds show a modulated cytokine pattern with increased early myeloid cell infiltrate. (A-B) Densitiy (in %, normalized to controls which were set to 100) and distribution of F4/80-positive macrophages (A) and Ly6G-positive neutrophils (B) in the skin after 3, 6, and 15 days. 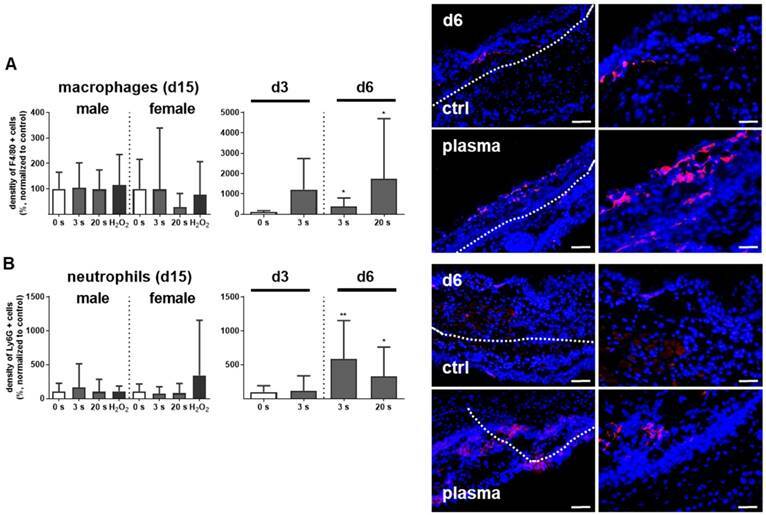 Representative images of F4/80- and Ly6G-stained (red) cells in wound regions (above the dashed line) on day 6 in plasma-treated compared to untreated mice. Scale bars are 50 µm (left images) or 20 µm (right images; higher magnification). (C) mRNA gene expression of inflammatory mediators IL-1β, IL-4, IL-6, MCP-1, TNFα, and TGFβ. (D) Cytokine secretion into the blood was measured for MCP-1, TNFα, and TGFβ 15 days after wounding using multiplex cytokine analysis. Males and females were used on d15 (as indicated; n ≥ 8); on d3/d6 only females were available for the measurements (n > 3). Data are presented as mean +/- S.D. ; *p<0.05, **p<0.01, ***p< 0.001, as compared to controls (ctrl) at each day and assay. 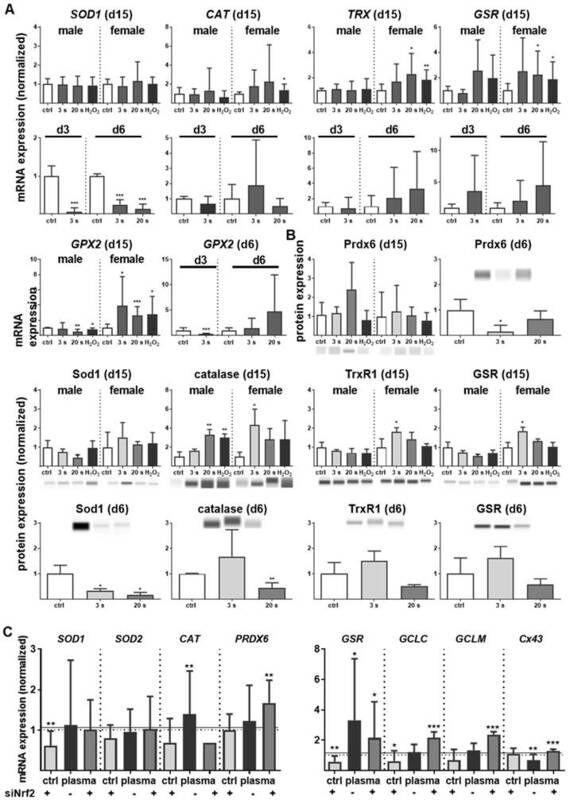 Moreover, the transforming growth factor β (TGFβ) transcription was elevated on day 6, suggesting an inflammatory counterbalance to transition from the inflammatory to the re-epithelization phase (Figure 2C). 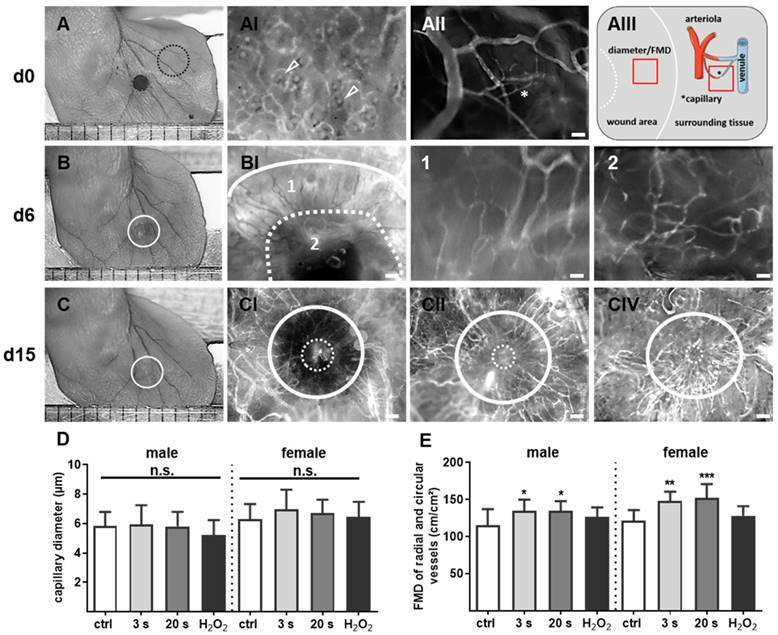 In females on day 15, a slight downregulation of TGFβ was observed, indicating an overshooting anti-inflammatory reaction that may have been responsible for excessive collagen deposits. 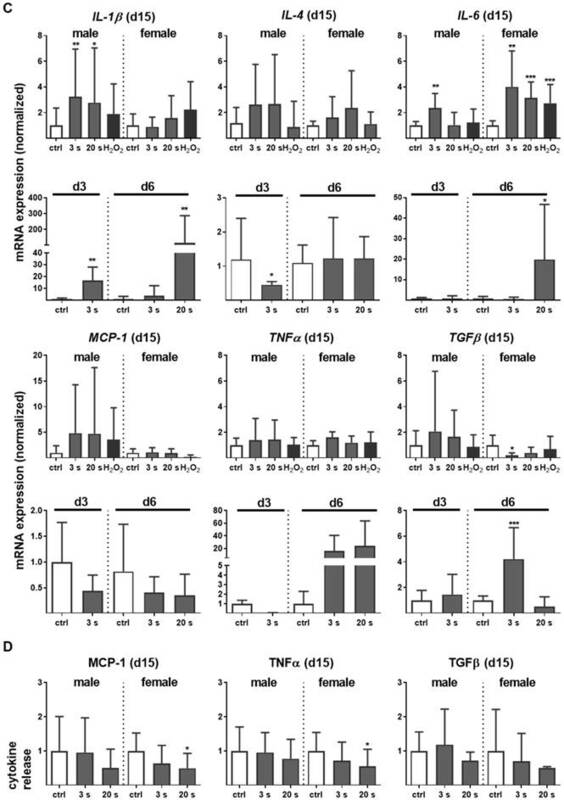 Moreover, no significant release of IL-1β, IL-6 (data not shown), MCP-1, TNFα, and TGFβ into the blood serum was observed on day 15 (Figure 2D), suggesting the repeated, plasma-induced inflammatory response is non-persistent at a systemic level. Inflammation and antioxidant defense are intimately connected. We identified an upregulation of the master regulator of antioxidant defense (Nrf2) of up to 200 times (Figure 3A). A concomitant substantial increase of heme oxygenase 1 (HMOX1, gene product of HO-1) levels was detected on day 3 (~250 fold) and day 6 (~100 fold) along with an early (days 3 and 6) and sustained (day 15) activation of NAD(P)H quinone oxidoreductase 1 (NQO1) at all time points. Western blot analysis confirmed an increase of Nrf2 at day 6 as well as of HO-1 and Nqo1 in plasma-treated wounds (Figure 3B). After plasma treatment and release of Nrf2 from Keap1 by oxidation events at cysteine, Nrf2 translocated to the nucleus as shown in skin sections (left panel in Figure 3C). 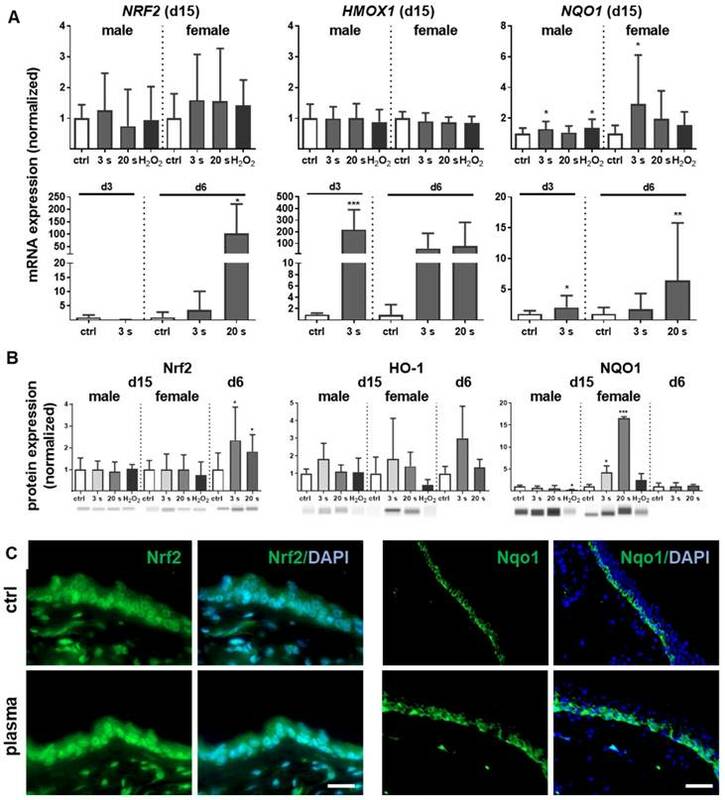 In contrast to the even distribution of Nrf2 within dermal and epidermal layers of the ear skin, Nqo-1 was mainly expressed in the basal epidermal layer as shown by immune fluorescence microscopy (right panel in Figure 3C). Cold plasma induces an early activation of Nrf2 signaling pathway which controls cellular defense. (A) Mice were treated with cold plasma as described. Quantitative PCR (qPCR) for NRF2, HMOX1 and NQO1 were performed with total RNAs isolated from the wound regions. (B) Protein expression of Nrf2, HO-1 and Nqo1 was determined using Western blot analysis. (C) Nuclear expression and distribution of Nrf2 (left panel) was shown after plasma treatment by immunofluorescence staining in dermal layers of skin sections. Nqo1 was mainly expressed in the epidermal layer of the skin (right panel). (D) Nrf2 translocation from cytoplasma (upper images) to the nucleus (lower images) after plasma treatment (60 s) was shown in dermal fibroblasts (left) and in epidermal keratinocytes (right). (E) Changes in mRNA expression following siRNA-mediated transcriptional repression of NRF2 (left diagram) and KEAP1 (right diagram) in keratinocytes evaluated for NRF2, KEAP1, HMOX1, and NQO1 by qPCR. The mRNA level of scrambled siRNA were set to 1.14 and 0.91 (black lines) wheras the mRNA and protein levels of untreated mice or mock control without siRNA were set to 1 (dashed line) with n = 3 to 9 mice depending on time point. Males and females were used on d15 (as indicated); on d3/d6 only females were available for the measurements. Data are presented as mean +/- S.D. ; *p<0.05, **p<0.01, ***p< 0.001, as compared to controls (ctrl) at each day and assay. Moreover, nuclear translocation of Nrf2 was demonstrated ex vivo in dermal fibroblasts and epidermal keratinocytes (Figure 3D) underlining the plasma-mediated activation of the Nrf2 pathway. To identify Nrf2-regulated genes following plasma treatment, Nrf2 and Keap1 were knocked down in keratinocytes (Figure S2). Basal expression of NRF2, KEAP1, and HMOX1 was decreased after Nrf2 inhibition, which could not be rescued by plasma treatment (Figure 3E). Conversely, blockage of the physiological Nrf2 inhibitor through siRNA targeting Keap1 resulted in normal baseline levels of HMOX1, NRF2, and NQO1, with plasma treatment not, or only moderately, increasing them. Results (Figure 3D and 3E) are from primary cells of male mice, and were similar for those of female mice (data not shown). Nrf2 regulates antioxidative response (ARE) genes. Expectedly, plasma treatment not only enhanced Nrf2 expression but also that of downstream targets, such as catalase (CAT), thioredoxin (TRX), glutathione reductase (GSR), and glutathione peroxidase 2 (GPX2). In contrast, cytoplasmic superoxide dismutase (SOD1) was significantly decreased by twofold changes on days 3 and 6 (Figure 4A). Western blot analysis confirmed a translational regulation of peroxiredoxin 6 (Prdx6), Sod1, Cat, thioredoxin reductase 1 (Trxr1), and GSR that was orchestrated by plasma treatment (Figure 4B). Next, down-stream targets of Nrf2 were analyzed in Nrf2 knockdowns, which resulted in the expected reduction of downstream target baseline levels (control columns for each target). In contrast to GSR, GCLC, and GCLM, mRNA was significantly increased after plasma treatment of knockdowns in primary cells of male mice (Figure 4C), with similar findings made with female mice (data not shown). This indicates an inverse regulation of both subunits. In summary, Nrf2 is a key response pathway to plasma treatment in skin cells in vitro and in skin in vivo. Cold plasma increased antioxidants in skin tissues and cells. (A) The mRNA expression levels in ear skin tissues from plasma-treated and untreated (ctrl) mice were compared and summarized in the indicated experimental groups: SOD1, superoxide dismutase 1; CAT, catalase; TRX, thioredoxin; GSR, glutathione reductase; GPX2, glutathione peroxidase 2. (B) Western blot analysis of peroxireductase 6 (PRDX6), Sod1, catalase, thioredoxin reductase 1 (TRXR1), and GSR. (C) Keratinocytes were transfected with siRNA targeting NRF2 and evaluated for SOD1, SOD1, CAT, PRDX6, GSR, GCLC, GCLM, and Cx43 mRNA expression by qPCR. The mRNA level of scrambled siRNA and mocked control without siRNA were set to 1.14 (black lines) and 1 (dashed lines), respectively. The mRNA and protein level of untreated mice were arbitrarily set to 1 with n = 3 to 9 mice depending on time point (dashed lines in d and g). Males and females were used on d15 (as indicated); on d3/d6 only females were available for the measurements (n ≥ 3). The data are presented as mean +/- S.D. ; *p<0.05, **p<0.01, ***p< 0.001, as compared to controls (ctrl) at each day and assay. Antioxidant defense and inflammation are necessary factors in wound healing but are insufficient without adequate blood supply. Therefore, neovascularization and growth factor expression were studied in control and plasma-treated ear wounds. Throughout all sampling time points, plasma therapy significantly upregulated CD31 (Figure 5A). Similarly, keratinocyte (KGF), basic fibroblast (bFGF), vascular endothelial (VEGFA), heparin-binding EGF-like (HBEGF), and colony stimulating (CSF2) growth factors were increased (Figure S2D), suggesting an improved wound vascularization. Inducible cyclooxygenase COX2 is fundamentally crucial in angiogenesis  and was strongly induced during the late stages of wound healing in plasma-treated mice. Furthermore, a moderate down-regulation of VE-cadherin (CDH5) on day 15 was observed (Figure 5A). Immune histochemical staining of wound tissue sections confirmed corresponding changes of the major angiogenetic factors such as CD31 and KGF (Figure 5B). Using Western blot analysis, we showed a moderate increase of KGF protein whereas the serine/threonine kinase Akt and the phosphorylated form of Akt (p-Akt) were significantly increased, especially in females (Figure 5C). Both are known to control several events that are critical for angiogenesis and homeostasis . Significant changes in mRNA expression levels of others angiogenetic mediators such as endothelial NOS (eNOS), artemin 1 (ARTN1), endothelin 1 (EDN1), ephrin 2 (EFNB2), platelet-derived growth factor receptor CD140a, matrixmetallopeptidase (MMP9), or inhibitor of MMP (TIMP1) during plasma-promoted wound healing were not detected (data not shown). To monitor microvessel networks directly, intravital microscopy was performed and revealed newly formed microvessel in a radial and circular pattern (Figure 6A-B). At day 6, the diameter and densitiy of radial and circular vessels did not significantly differ between groups and were therefore not presented in detail. The resolution of microvessel pattern shown by intravital microscopy was limited due to the technical errors in FITC-dextran injections and hence not quantified. Scoring of neovascularization is described in Table 2. On day 15, the microvessel network (Figure 6C) was additionally quantified by determination of vessel diameters and functional microvessel density (FMD). No significant difference for radial or circular diameters was observed effect with 3 s or 20 s plasma treatment (from 5.9±0.4 µm to 6.9±0.4 µm) when compared to controls (from 5.8±0.3 µm to 6.4±0.3 µm) (Figure 6D). Although, the FMD was between 220 and 230 cm/cm² in sourrounding tissue (data not shown), the FMD was relatively low (mean level 130 cm/cm²) in the wound area in all experimental groups. However, and compared to controls (appr. 120 cm/cm²), FMD significantly increased upon plasma treatment (135 to 150 cm/cm², Figure 6E) but did not reach the same level as in the sourrounding tissue at this time point. Nevertheless, the findings support the notion of enhanced angiogenesis in plasma-induced healing. Proliferation and apoptosis are prerequisites to wound healing. Plasma treatment significantly increased basal proliferation on days 3 and 6 (day 15 in tendency), as seen with Ki67-positive cells in the wound region (Figure 7A). Conversely, apoptotic cells were significantly decreased in the plasma groups on day 6. On day 15, there were only slight differences in the number of apoptotic cells in the wound region (Figure 7B). The lower frequency of TUNEL+ apoptotic cells may be due either to enhanced macrophage numbers and activity, or a redox-mediated suppression mediated by plasma-derived reactive species. To test the latter option, transcriptional modulation of p53 and its downstream targets of the apoptotic branch BBC3/Puma (a p53 upregulated modulator of apoptosis), the pro-apoptotic BAX, the anti-apoptotic BCL2, the cell cycle arrest branch with CDKN1A (encoding p21), and the DNA repair branch (GADD45α) were investigated. 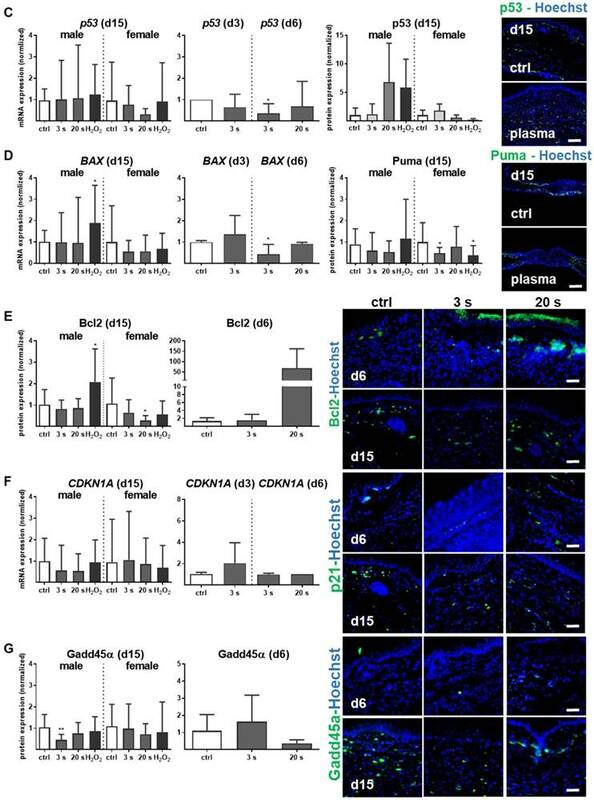 Plasma treatment mainly inhibited p53 and BAX expression at early wound stages, whereas PUMA protein expression was moderately but significantly down-regulated in females on day 15 (Figure 7C-D). In contrast, the anti-apoptotic Bcl2 was upregulated 50-fold on day 6 in the 20 s plasma group but decreased to baseline levels on day 15 (Figure 7E). CDKN1A (Figure 7F), encoding protein p21 (data not shown), and Gadd45α expression (Figure 7G) remained largely unchanged at all sampling time points and treatment conditions. This finding suggests negligible toxicity or genotoxic stress as a result of exposure to plasma-derived reactive species. Additionally, qualitative (Figure S1D) and quantitative (qPCR, data not shown) measurements failed to find increased levels or increased phosphorylation of histone A2X, a marker of DNA damage and repair. The idea that wound healing was subject to redox control was proposed more than a decade ago . Although numerous findings in this regard were made while investigating cell-derived reactive species, the application of short-lived exogenous species triggering the same wound-spurring redox pathways has been limited to date. Cold physical plasma is a technology that generates a multitude of reactive species in the gas phase that are transported to tissues. Here, we not only demonstrated the capacity of plasma to enhance wound healing, but also provided mechanistic insight on crucial changes in inflammation and signaling pathways that are associated with improved healing responses. Promotion of pro-angiogenic factors in plasma-treated wounds. (A) SKH1 mice were either exposed to plasma for 3 s or 20 s or were left untreated (ctrl). The mRNA level of CD31 was strongly increased on day 15 (**p< 0.01). Both the basic FGF (bFGF) and KGF (FGF7) were significantly upregulated in the plasma-treated animals at all time points. Cyclooxygenase (COX2) and VE-cadherin (CDH5) were only regulated on day 15 in the plasma-treated groups. (B) Immunohistological staining confirmed a stronger expression of CD31 (arrowhead) and KGF (asterisks) after 6 days in plasma-treated animals compared to controls. Scale bar is 50 µm. (C) KGF protein expression showed a significant increase on day 6 whereas Akt and phospho-Akt proteins were up-regulated in plasma-treated females. Males and females were used at on 15 (as indicated, (n > 8). ); on d3/d6 only females were available for the measurements (n > 3). The data are presented as mean +/- S.D. ; *p<0.05, **p<0.01, ***p< 0.001, as compared to controls (ctrl) at each day and assay. Plasma-supported formation of microvascular network during wound healing. (A-C) Representative photomacroscopic images of ears and intravital fluorescence microscopy images of microvascular features in wound regions (white circles). (A) A typical microvascular architecture of non-wounded skin with papillary loops around empty hair follicles (arrowheads in black dashed circle) is shown in hairless mouse (AI). Visualization of arterioles, venules and capillary (*) in the ear tissue (AII) and schema of diameter and functional microvessel density (FMD) measurements in one cm² (quadrat) in wound area and surrounding tissue (AIII). (B) During the first days of wound healing (d6), the microvessel network creates an outer ring of radial vessels (BI; higher magnification in 1) and an inner circular ring (dashed line) to the wound margin (BI, higher magnification in 2). (C) Novel formed microvessels are between white circles in untreated controls (male, CI), plasma-treated males (CII), and plasma-treated females (CIII). The white continuous line marks wound area on day of wounding, the dashed line represents the eye of wound at indicated time points. Scale bars are 1 mm (A-C); 200 µm (AI-II, BI, CI-III); 50 µm (B1-2). (D-E) Quantitative analysis of vessel diameter (µm) and FMD (cm/cm²) in both gender (n≥3). Males and females were used on d15 (as indicated, n > 8); on d3/d6 only females were available for the measurements. The data are presented as mean +/- S.D. ; *p<0.05, **p<0.01, ***p< 0.001 using one-way ANOVA. 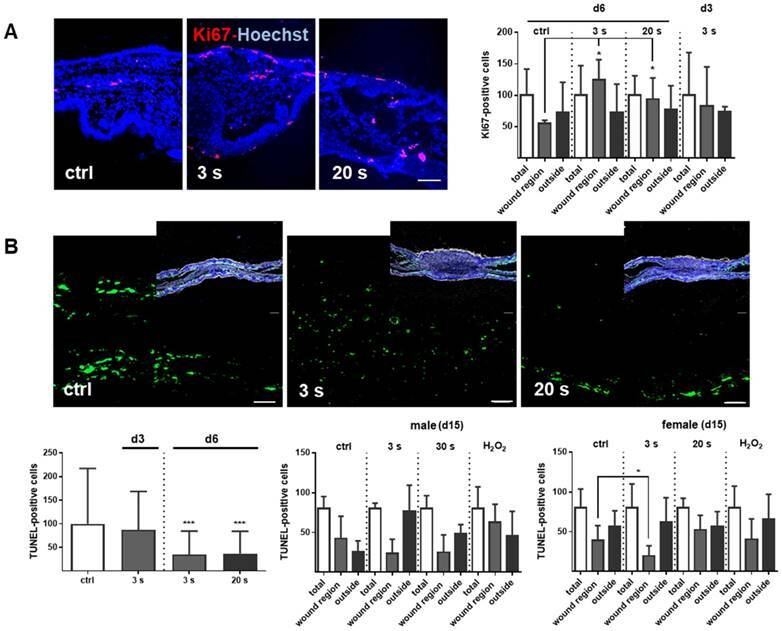 We identified the pivotal involvement of the redox-regulating Nrf2 and p53 signaling pathway in cold plasma-treated wounds. Redox signaling transcriptionally controls protein and enzyme activity as well as post-translational modifications such as nitrosylation, hydroxylation, and glutathionylation . Nrf2, as a gatekeeper of intra- and extra-cellular redox signals, enables responses to oxidizing noxae . Glutathione (GSH) metabolism via transcriptional modulation of GSR  and the antioxidant glutathione peroxidases (GPX)  are also under the control of Nrf2. We found a protective Nrf2 signaling in response to plasma that counteracted oxidative stress via upregulation of its down-stream targets such as catalase, peroxiredoxins, and thioredoxins (TRX) during wound healing. Through reactive species-induced oxidation of Keap 1 cysteines, which act as redox-sensor, activation of Nrf2 is allowed, leading to an increase in antioxidant defense, which was also shown in human keratinocytes in vitro , further supporting our findings in this study. TRX functions to reduce oxidized target protein cysteine disulfides that were generated from excess oxidants . CDKN1A, another target of Nrf2 , is a key downstream molecule of p53 modulating cell-cycle and glutathione metabolism that again feeds into antioxidant defense . Nrf2 also signals inflammation via inhibition of NF-κB , activation of HMOX1 (encoding HO-1), and COX2 . A previous study found that Nrf2-ARE-driven genes such as HMOX1, NQO1, and glutamate cysteine ligase (catalytic GCLC and regulatory subunit GCLM) block monocyte chemoattractant protein-1 (MCP-1/CCL2) . Interestingly, we observed a strong up-regulation of GCLC and GCLM after plasma treatment and Nrf2 knockdown, suggesting that other pathways can compensate the knockdown of Nrf2 in vitro. The most likely candidate for this compensatory effect after siRNA targeting Nrf2 is Nrf1/3 . Nrf2 is also a key regulator in macrophages . Macrophages are innate immune cells, which secret and respond to a repertoire of cytokines, e.g. TNFα, in an autocrine or paracrine manner, thus emphasizing the inflammatory response . Their migration, maturation, and phenotyping are tightly controlled throughout physiological wound healing phases . In our study, plasma increased macrophage and neutrophil influx and upregulated pro-inflammatory markers IL-6 or TNFα at early but not later stages of wound healing. This finding suggests that mild inflammation by plasma treatment is necessary to recruit myeloid cells, followed by an increase in anti-inflammatory and antioxidant pathways such as Nrf2 at early stages. Our in vitro results confirmed a Nrf2-dependent inhibiting of pro-inflammatory cytokines as shown by siRNA knockdown targeting Nrf2, which has been demonstrated in previous studies . Cell proliferation and programmed death are dependent on reactive species-mediated signaling [3, 15, 50]. Observational studies of plasma-accelerated reepithelialization and granulation in animals [51-54] and humans [23, 24, 55-57] support this notion. Using Ki67 as a marker, we observed an increase in proliferation and tissue repair and the earlier development and accumulation of granulation tissue, together with increased collagen expression after plasma treatment. p53 and its down-stream targets mediates programmed cell death in wounds [12, 58]. Its activity depends on the stage of wound healing, which our data confirm. Cold plasma increases proliferation and attenuates tissue apoptosis by regulation of p53 signaling in dependence of wound healing stages. (A) SKH1 mice were either exposed to plasma treatment (3 s and 20 s) or were left untreated (ctrl). 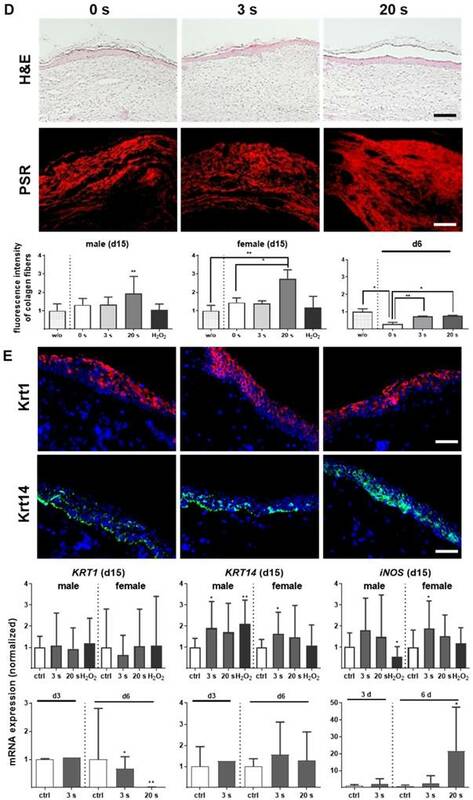 Ki67-positive cells (red) were significantly increased in the plasma-treated skin in contrast to untreated mice. (B) TUNEL-positive cells (green) were rarely seen in the dermis of plasma-treated skin (3 s or 20 s) in contrast to untreated mice (ctrl). The nuclei are labeled with Hoechst 33342 (blue). Scale bar is 50 µm. (A-B) Quantification of Ki67- and TUNEL-positive cells show a significant increase of proliferative cells on day 6 (A) and a decrease of apoptotic cells in the regenerating skin after plasma treatment. Outside of the wound regions, no differences were detected (B). (C-D) Gene expression levels of p53 and BAX (left diagrams) were significantly down-regulated on day 6. p53 was moderately up-regulated on day 15, which was confirmed by protein expression on day 15 (right diagram). Puma protein levels were significantly decreased in females on day 15 (right diagram). (E) The anti-apoptotic protein Bcl-2 was mainly up-regulated after 6 days but mainly unchanged on day 15. (F-G) CDKN1A expression level (F) and Gadd45a protein expression (G) were unchanged upon plasma treatment. Males and females were used on d15 (as indicated, n > 8) on d3/d6 only females were available for the measurements (n > 3). The data are presented as mean +/- S.D. ; *p<0.05, **p<0.01, ***p< 0.001, as compared to controls (ctrl) at each day and assay. Pro- and anti-apoptotic factors control the removal of inflammatory cells and angiogenesis . Moreover, p53 is central in angiogenesis and essential in the regulation of nitric oxide synthase (NOS) . Our results are consistent with other studies  showing that the overexpression of NOS causes the down-regulation of superoxide dismutase 1 (SOD1) . Plasma-released NO [62-64] may be a driver for the increased iNOS and COX2 expression observed here in plasma-treated ear wounds. COX2 regulates angiogenesis via growth factor expression . 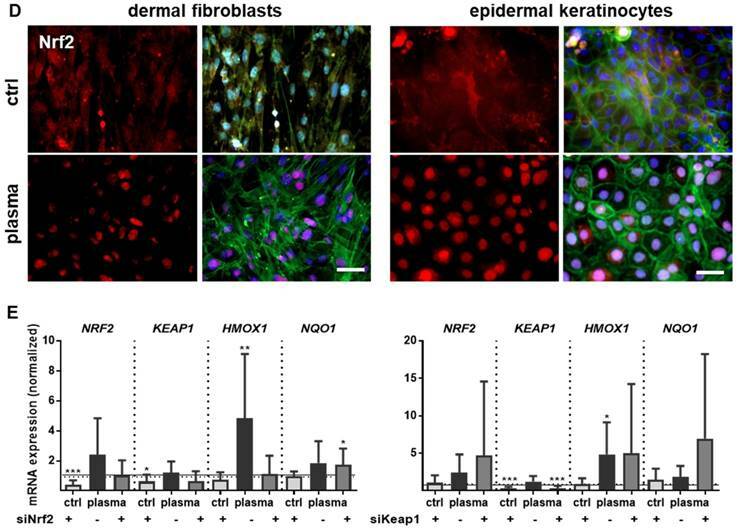 Plasma induces the upregulation of growth factor and angiogenic transcripts in human keratinocytes , a finding confirmed by this study (e.g. KGF, FGF, VEGFA, HBEGF, CSF2, bFGF, CD31, Akt/p-Akt). In support of our findings, p53 silencing improved diabetic wounds through augmented CD31 and VEGF expression  and KGF receptor activation, which is central during wound healing . Moreover, Akt takes a center stage in angiogenesis signaling . Intravital microscopy (IVM) confirmed that plasma treatment triggered an “angiogenic switch” also known to be induced in principle by other signals such as metabolic and mechanical stress as well as immune and inflammatory responses . The increase of functional microvessel density (FMD) upon plasma treatment may have increased oxygen and nutrient supply into the wounded area. Oxygenation has been suggested to be benifical in healing of chronic wounds . Interestingly, several studies pointed out the pivotal role of Nrf2 in angiogenesis [69, 70] by promoting vascular development , preventing downregulation of insulin and MAPK signaling  and reduction of oxidative stress in endothelial cells . Moreover, plasma-induced regulation of Nrf2 and down-stream targets coincided with angiogenesis [74, 75]. Vice versa, Nrf2 dysfunction is responsible for impaired angiogenesis and microvascular rarefraction . In our study, we found knockdown of Nrf2 correlating with a reduced growth factor expression in keratinocytes (Figure S2), supporting the view of an accelerated healing response including neovascularization and angiogenesis following plasma treatment. Our study has limitations. First, we were not able to fully explore the gender dimension of the molecular mechanisms on wound healing on day 6 to possibly explain different healing responses with plasma seen in male vs. female mice. These differences may be explained by mutual cross-talk between redox and hormone signaling , as demonstrated before [78-80]. Second, defective wound healing in patients often is a problem of the elderly. Our study design intended to address the molecular mechanisms of plasma-induced wound healing, and understanding the role of age in these processes may be a subject of future studies. In summary, repetitive treatment with cold physical plasma-derived reactive species promoted early ear wound closure in SKH1 mice. This finding was associated with an enhanced infiltration of macrophages and neutrophils, an upregulated transcription of both pro-inflammatory and anti-inflammatory mediators, increased proliferation and decreased apoptosis, a spurred antioxidative defense response driven by Nrf2, and enhanced angiogenesis. Wound healing is a multifactorial process. Hence, isolating a single above mentioned effector as the main driver of reactive species-driven acceleration in wound healing would be inappropriate. Instead, redox-driven processes that are initiated with plasma-derived species appear capable of spurring several physiological processes. Unraveling their molecular details may support new avenues for skin regeneration and, importantly, for treating poorly healing wounds. ARE: antioxidant response element; Keap1: Kelch-like ECH-associated protein 1; Nrf2: nuclear factor-erythroid 2-related factor 2; RNS: reactive nitrogen species; ROS: reactive oxygen species. The authors thank Liane Kantz, Caner Özer, Uyen My Vu (all INP Greifswald, Germany), and Dorothea Frenz (IEC, University of Rostock, Germany) for their technical support. This work was funded by the Ministry of Education, Science, and Culture of the State of Mecklenburg-Western Pomerania (Germany), the European Union, European Social Fund (grant numbers AU 11 038; ESF/IV-BM-B35-0010/13 and AU 15 001), and the German Federal Ministry of Education and Research (grant number 03Z22DN11). All authors contributed to this study: AS designed and performed the experiments. BV provided the mouse model. All authors wrote the manuscript.